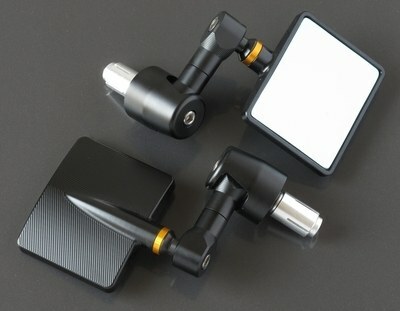 Pair of our highest quality rectangular bar end alloy mirrors. Pair of left and right hand superior quality bar end mirrors. CNC machined from billet aluminum alloy (no die casting here). When you hold these in your hand, the top quality will immediately be evident. Anodized black with gold accent. 4" (measured diagonally) rectangular blue tinted convex glass mirrors offer a non-glare widened angle of view. These will fit most new and vintage motorcycles with standard 7/8" bars or clip-ons. Fully adjustable. Suitable for Yamaha SR500, SR400 , XS650, CB750 and many other vintage cafe racer, street fighter, and custom projects. Quoted price is for a pair of left and right mirrors. MotoLanna will be closed from January 15 – January 26. MotoLanna will be closed from November 1st – November 7th for the Malaysian MotoGP. MotoLanna will be closed from July 28th – August 13th. MotoLanna will be closed from 24/5/2018-31/5/2018. If you have time sensitive parts needs, please place your order by the 23rd of May. Thank you. Daniel Peter's New SR500 Scrambler Build! Pay With Bitcoin And Receive A 5% Discount!